Tacos de canasta, or basket tacos can be found all over Mexico City. These are the second most common taco,in my observations, to tacos de guisado, or stew tacos. And Mexico City is Mexico's center of basket tacos. In other parts of Mexico they are called tacos al vapor, steamed tacos, or tacos sudados, sweaty tacos. There are a couple of other terms, but these are the most common. But basket tacos get their name from the basket in which they are steamed. 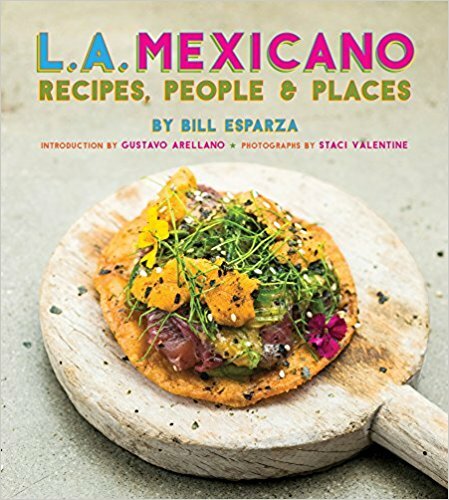 Traditionally,the tacos are made at home, or at a commisary kitchen,and then are brought to the stand in a basket, the tacos wrapped in a towel. On the way to the workplace they steam naturally. During this steaming period the tacos ooze their luscious fillings into the tortillas, giving them an attractive sheen. The traditional fillings for this genre of taco are:mole verde(green mole),adobo,frijol(refried beans),papa con huevo(potato and egg), and chicharron(pork skin).These deeply flavored tacos are available for $5.50MXP, that's about 42 cents each, and these aren't exactly small. You can easily satisfy yourself with two, but have three or four and you're ready to take on the second largest city on the planet with gusto. Tacos de Canasta El Flaco is a family run stand a short walk from the Zocalo(public square). Like many of the tacos de canasta stands, there is no name other than the taco type. The Gonzalez family has been churning out the same 5 recipes for 50 years, and keep with just the traditional fillings, while some other stands have added a few other fillings here and there. The tacos are stacked in a customized cardboard box used by many of the basket taco stands, and covered with a towel, which is the best method of steaming these treats. At these prices, the only extravagances are pickled chile and vegetables, and a green salsa.The pickled vegetables, known as escabeche, are home made, with cauliflower, carrots, and jalapenos. There are many large florets of cauliflower in the escabeche, which are snatched up by greedy hands, eager to get their 42 cents worth. The salsa has a medium heat, you don't want to overpower these tacos. They provide pleasurable bites without need for condiment. The mole verde contains just enough bits of pork, as a mole should be about the mole, and has a rustic spice. The flavor on tacos de canasta is all about intensity. You can taste these tacos before they hit your palate, no inhalation required. The potato with egg with its sweaty exterior is a Sunday morning at your favorite greasy spoon. The stained adobo taco is another sauce perfected, with only that which is necessary to create instant addicts. These tacos are opiates of the masses. Just as in the adobo, each taco bends and droops as you pick it up, and the insides are mushy mounds of savory bites. You can open them up to apply salsa, risking a tear or the tortilla, so many just apply salsa atop each taco. Others eat these tacos as they are, using strips of fallen tortilla to mop up anything left on the small plastic plates.The adobo also contains pork. But the biggest seller is the chicharron, with the most substantial amount of meat, pork skin, to be exact. These are usually the first to sell out. Each taco contains the flavors of 50 years of a family's pride. I didn't get to the refried bean,and while you may think a refried bean taco might be uninteresting, you would most definitely be wrong. I've had these before at other stands, and if you are a great cook, whatever you put in your taco will be amazing.Making great beans is another source of competitiveness found in Mexico households. These tacos have flavors that are unreal,so delicious they send tingles down your spine.It's the ultimate economic pleasure, and the tacos de canasta specialists have discovered a way to deliver satisfaction at a premium and still make a profit. Tacos de canasta are another one of the countless artisan traditions of Mexico, where specialization and competition drive the cooks, chefs, and taqueros towards excellence.